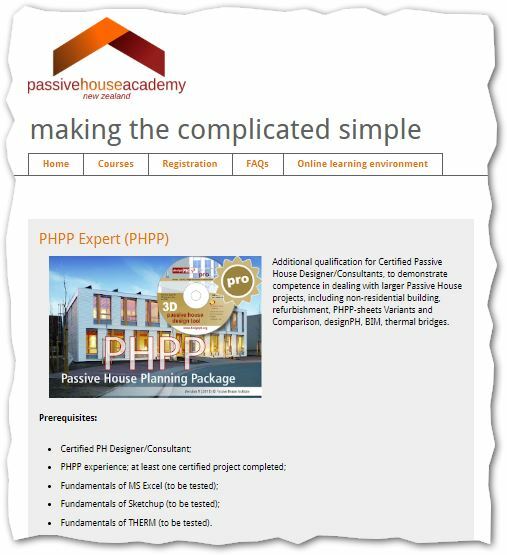 10 April 2019 Passive House Academy: PHPP Expert (PHPP) | Sustainable Engineering Ltd.
Jason Quinn will be teaching this class along with Dr. Kara Rosemeier of Passive House Academy. Visit Passive House Academy for more details. The course will assume you are VERY familiar with PHPP and have completed at least one simple residential project through certification. Over the course of three days we will work through all of the learning criteria for the PHPP Expert Exam with a NZ and AU focus. To be clear the learning targets include the PHPP Basics but these are Prerequisites to taking the course and will not be covered in the course. Achieve an understanding how to enter more complex residential as well as non-residential buildings, how to enter retrofits and step-by-step retrofits and how to use the variant calculation concept to optimize the efficiency design of a project. Achieve the capability to use designPH to set up 3D models of a building envelope, how to assign the correct component qualities and how to update the building model and export it to PHPP. Achieve an understanding of how to set up 3D models of a building envelope in BIM authoring tools, how to assign component qualities to the model and how to export the building model to PHPP. –Note this is understand and BIM will be given only a short section.